Cheryl is running a fun KINDLE giveaway during the blog tour. Continue reading for more information. 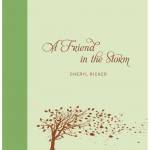 About A Friend in the Storm: This ninety-six page gift-book combines heartfelt poetry with powerful quotes and Scripture verses to speak to the heart and soul of anyone going through difficult times. The beautiful fabric binding with foil stamping makes this the perfect gift for anyone seeking comfort. This elegant gift book will reach the heart and soul of anyone facing difficult circumstances, leading them through their suffering into the arms of a faithful loving God. Each two-page spread includes a poem, as well as reflections written by Christian leaders, along with healing Scripture verses. About Cheryl Ricker: Cheryl Ricker has a degree in creative writing and has written columns and articles for various magazines and newspapers. She’s been writing poetry all her life and her poems have won awards in fine arts and literary magazines. Cheryl lives with her husband and two sons in Rochester, Minnesota. Please check out Cheryl’s amazing website for more information. Lisa’s Thoughts: I received A Friend in the Storm as a free book from Zondervan in exchange for participating in this blog tour. As soon as I received it, I opened it and started going through it. This beautiful book’s poetry with its meaningful quotes, restful colors, and soothing images flows over wounded hearts and surrounds them with serenity and comfort. As a mother of a poet, I truly appreciated Cheryl’s talent. Her words spoke to me in a way I didn’t expect. Her love of Jesus shines in each verse. There’s a comfort in knowing Who she loves. I tried to pick out a favorite poem, but it was a fruitless task because each one speaks to me in a different way. Buy her book and see for yourself! Cheryl Ricker is hosting this great contest over at her website during the blog tour for A Friend in the Storm. A Friend in the Storm, Zondervan’s latest innovative gift book of quotes, Scripture and poetry that leads to lasting hope! Since this book covers matters of the heart, Cheryl wants to hear from YOUR heart! In the midst of any type of loss, grief or crisis, A Friend in the Storm takes you on a healing journey where you experience Christ’s love in a fresh, memorable way. Now she invites you to submit an original poem, story or snippet about a time when someone was a friend in your storm… and she’s giving you the opportunity to win a KINDLE to do it! The Facebook Party will be a blast! Not only will she be announcing the Share Your Storm Kindle Giveaway winners, but she’ll also be chatting with party goers, hosting fun trivia contests, and giving away even more prizes every 10 minutes – including signed copies of A Friend in the Storm, and gift certificates to Amazon.com and Starbucks.com! Share this on FACEBOOK: Want to help someone who’s hurting? “A Friend in the Storm,” Zondervan’s latest gift book of quotes, Scripture and poetry, is helping thousands find lasting Hope! Go here http://ow.ly/2BYiN to to enter to win a KINDLE! My mom can remember the details of where she was when President Kennedy was assassinated. I remember being in 7th period study hall during my junior year when we heard about the space shuttle Columbia tragedy. On September 11, 2001, we were giddy with excitement–okay, can’t say I’ve ever seen Hubby giddy with excitement–to board the shuttle bus from our resort at Walt Disney World to take us into Magic Kingdom. We spent a couple of hours getting wet on Splash Mountain, going on the Jungle Cruise, and seeing the Country Bears. Suddenly, attractions were closing, and people were being herded (best term for it) to the main entrance. Rumors were being repeated, almost like a game of Telephone. Snippets of Twin Cities, or was it Twin Towers, planes, bombings spread through the massive numbers of people. We returned to our resorts and were told we could not leave them. Once we got into our room, we turned on the TV and cried as we watched the travesty being brought against our nation. Hubby, who is a former Marine, was stationed in Quantico, VA for three years. He spent a lot of time in D.C. and knew exactly where those planes had hit. Our families panicked when they couldn’t get ahold of us by phone because they had heard the major US resort areas were going to be hit too. When I talked to my sister, we cried together. Heroes died that day. Unsung heroes who were nameless faces in the crowds. Heroes who battled flames, treated the wounded, and prayed over the desperate. Heroes who sacrificed their lives so others could live. Heroes who became Jesus in the flesh. Our country changed that day. Prayer for the brokenhearted drew people closer together and closer to God. 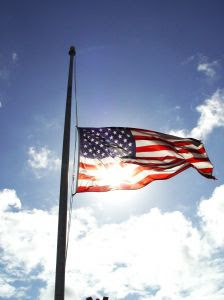 We can’t afford to forget September 11, 2001, because we can’t afford to take our days for granted. God gives us a precious gift called the present. We need to make the most of every day and make sure our loved ones know how much they mean to us because we don’t know what tomorrow brings. I’m so thankful I live in a nation that honors freedom of worship. I’m so thankful for the service men and women who fight at home and abroad for our nation’s freedoms. I’m so thankful for their families who support them when they can’t be together. I’m so thankful for the everyday heroes who put their lives on the line to save others. I’m so thankful for those medical heroes who work tirelessly to minister to the sick and wounded. I’m so thankful for those heroes that go unnoticed like our educators. Let us join together as One Nation Under God and never forget. Where were you when you heard the news? How has this tragedy strengthened your faith? My social networking fast is officially over! Instead of repeating myself here, head over to MBT Ponderers to read what I wrote about accountability. I’ll be back to my regular posting schedule for the rest of this week.